The Old Foodie: A Better Soda Cracker. 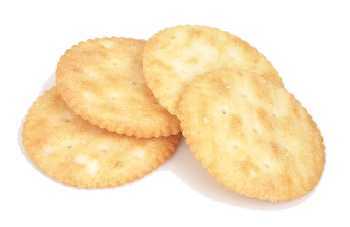 A cracker, according to the OED, is a thin, hard biscuit. According to a lot of military men, it is a damn hard biscuit. The military version - “hardtack” - has been called by many names over many centuries by many soldiers and sailors - all of them descriptive, but none of them flattering. Aussie “Diggers” for example have referred to their ration biscuits as Stone Bread, Teeth Dullers, Sheet Iron, Flour Tile, Concrete macaroons, and Ammo (ammunition) Reserves. One particular Digger described them as having “the delicious succulency of ground granite or the savoury toothsomeness of powdered marble”. Cracker biscuits had two important attributes in their military incarnation: their keepability and their absorbability. The former might have been more important to quartermasters and victuallers, but for soldiers, the absorbability of their biscuits served the dual purpose of avoiding broken teeth and making mealtime slop less sloppy (and hence the names “cracker hash” and “cracker stew”). This attribute has also been used by civilian cooks and housewives since at least the middle of the nineteenth century. By soaking up other standard flavourings, particularly in pies, they provided an illusion by association of the real thing – such as apples (the most common) or the meat in mincemeat pie, in this Canadian recipe from 1890. Three soda crackers rolled fine, one cup of cold water, one cup of molasses, one-half cup of brown sugar, one-half cup of sour cider or vinegar, one-half cup of melted butter, one half-cup of raisins, one half-cup of currants, one egg beaten light, one teaspoonful of cinnamon, one-quarter teaspoonful each of cloves, allspice and nutmeg, five apples chopped fine. Cracker biscuits are not purely a military phenomenon of course, but there is an element of abstemiousness and virtue about them even in civilian society where they serve to make a bowl of soup look like a real meal, or to levitate a piece of cheese to the mouth in a polite way. One day, something made someone in the Nabisco Company decide that the world needed a better cracker, one of less than military strength, and – to cut what was probably a longish story short – the Ritz Cracker was conceived. It was delivered on this day in 1934, with its name already decided by virtue of a competition. What a genius of a name! Four letters to overcome the connotations of hardship and hard texture and the dreariness of the Depression by associating the new biscuit with Cesar Ritz and his exclusive hotels! This new improved cracker needed a new improved Mock Apple Pie of course, and a back-of-the-box recipe soon appeared which has become something of a cultural icon (although I am not sure which culture it belongs to), with its own cult following.